With 25 years of experience, Deputy Chief Coleman offers a common sense approach to handling larger, more unusual second and third alarm, or mutual-aid fires. He covers organization and structure, incident management, safety issues such as accountability systems, the rules of engagement for risk assessment and managing the Mayday, as well as fires in distinct occupancy types. Case Studies are designed for departments of any size. Contents: Part 1: The form of he response Review of the incident management system. Contents: Part I: The form of the response Review of incident management system Sectoring large incidents Resource allocation The rules of engagement-Risk assessment in the fire service Accountability at major incidents Managing the Mayday. Part 2: The Fireground Fighting Fires in: Older apartment buildings; Garden apartments; strip malls; Vacent commercial occupancies; Institutional occupancies; Lumberyards; Enclosed Malls; Resturants; Churches; Nursing homes; Industrial areas; Hotels; Professional buildings. Skip Coleman is Deputy Chief of Fire Prevention/Communications for Toledo (OH) Department of Fire and Rescue. 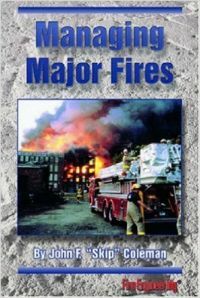 He is also the author of Incident Management for the Street-Smart Fire Officer from Fire Engineering Books & Videos.